I have been writing these ordinary moments posts now ever since I started blogging and they are still some of my favourites to write, I love to look back on the moments I know I would otherwise forget and love the incentive it gives me to notice them in our every day ordinary lives. What I really appreciate though is to take note of these most ordinary of moments even in the special, extraordinary times like where we are at the moment. On holiday. Of course it has not been the most ordinary of weeks at all as we have been in Portugal for a week now and with the heat, the beautiful view and the daily swims in the pool it has been as far away from our ordinary days as you can really get. However, with children especially, there will always be the ordinary too that in the big scheme of writing about our trip, vlogging it and taking it all in will still get overlooked and never documented so I thought I would capture them here, even though I am on holiday I am currently sat in the bar area with my laptop and a coffee and I have definitely had worse places to write from! The one thing we were nervous about before we came away was sleep. 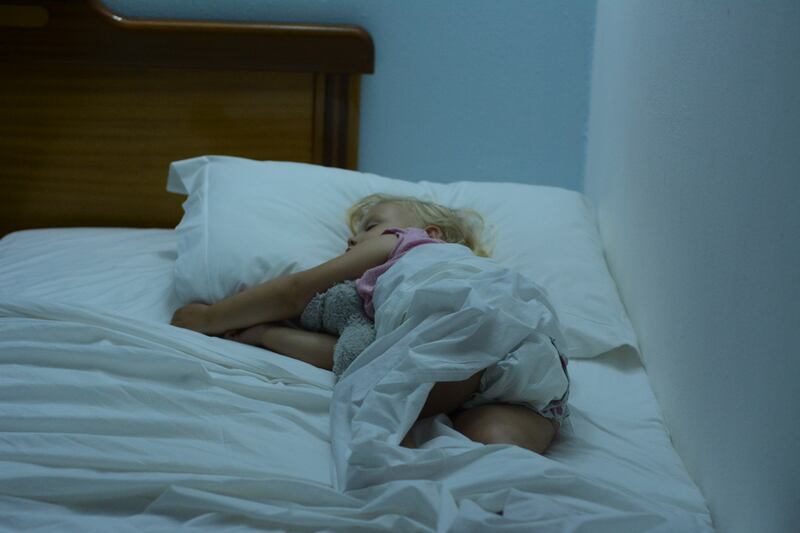 Probably like most parents of young children one of the considerations when choosing accommodation is the sleeping arrangements and ensuring everyone gets as much sleep as possible. We are definitely a family that needs it’s sleep, me especially and experience has taught us that our children cannot cope with lots of late nights, they don’t nap and our days are just smoother and happier if we forgo the late night dinners and sunset walks on the beach every day in favour of our usual bedtime routine. It makes for happier children and more relaxed parents, I know it isn’t the norm on holiday but it works for us and anything for an easier life I say. 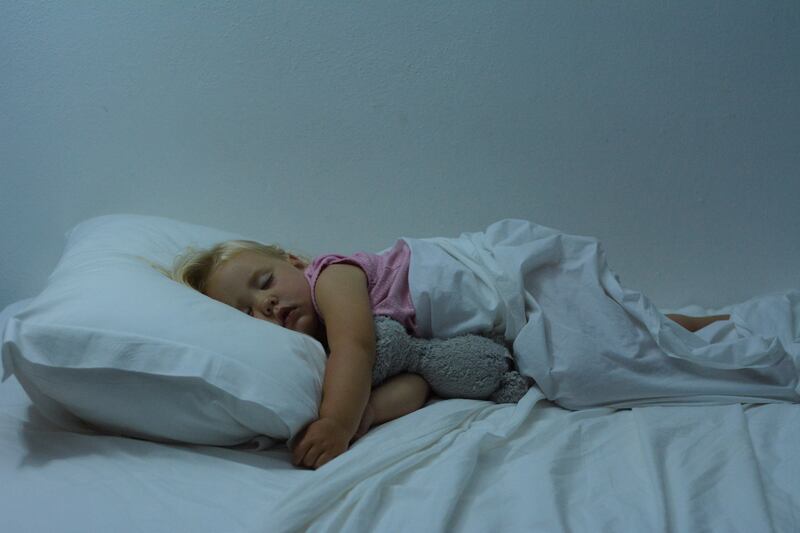 Eva takes after me on the sleep front for sure and has always been an independent sleeper, both of them have actually so although we opted for a one bedroom apartment (basically to give us an evening!) we were incredibly nervous of them sharing. 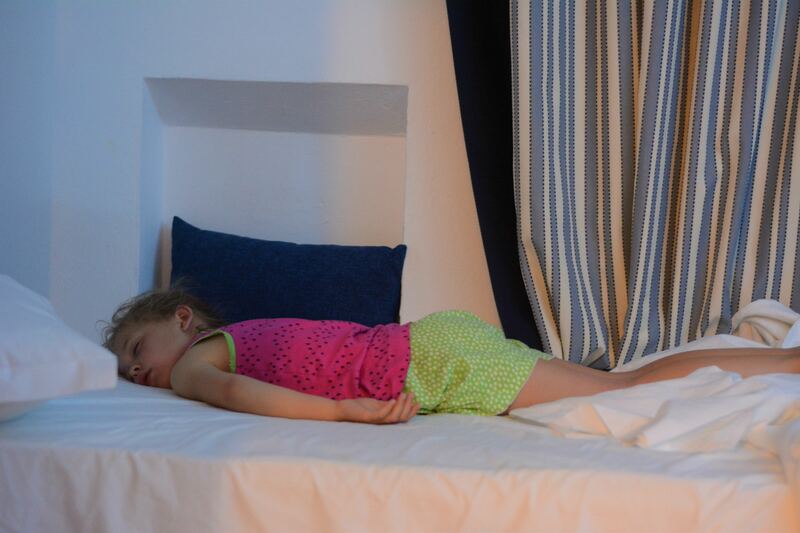 Roma has never been the most settled sleeper and they have only ever shared a room once in a hotel in LEGOLAND and to cut a long story (and even longer night) short it didn’t go well and we entered our second day at LEGOLAND on very little sleep! We told ourselves that was one night and Roma is sleeping much better now so two weeks would be fine. Right? The first few nights didn’t go too well. They were effectively sharing a bed with the two singles pushed together and we would hear moans that one was encroaching on the other, Roma of course and it took them so incredibly long to go to sleep meaning we would get cross and stressed and we would have very tired children the next day. I had visions of this cuteness that I see others have when they find them asleep in each others arms, entangled in one another’s legs as they strive to get closer still and my heart would melt as I checked on them before I laid down for the night, on a single sofa bed – oh the glamour! Well, that isn’t us, after trying to put a barrier of pillows in between them we started a new tact. Separate them. To be fair they are very different sleepers and given the four year age gap we needed to adapt. Eva sleeps with a little nightlight, Roma likes it dark, Eva reads for a while before she goes to sleep and Roma likes to chat to someone or to herself she isn’t fussy, it’s not a great combination. We opted to move the beds to the other side of the room, to put Roma down at 7 as usual, wait until she was asleep while we played games or read with Eva and then put her to bed after and hope for the best. I have to say it has gone so much better than I could have imagined, they both sleep soundly mostly from 7/7.30 until the same time 12 hours later when inevitably we hear them chatting (from the comfort of their separate beds of course) or they shout for us without moving a muscle. Of course it would be nice to have that closeness and them cuddling up to one another in slumber but it makes me smile that they are different, it makes me grin from ear to ear that they chat from separate beds never encroaching on the other and that they have got into their groove with each other. It might be different to others but it definitely works for us and my most favourite thing of all to do is to sneak in before I go to bed and watch them sleep. I don’t think I am alone in the fact that I never love them more than when you see their innocent little peaceful faces deep in slumber, eyelashes flickering, legs twitching, that stuffy nosed snore from Eva’s face which transforms from oh so grown up to my little baby with the close of an eyelid, or indeed finding them in crazy positions and kissing their heads as I put them back without waking them. I will do that every night for as long as I can because this ordinary moment will never ever get old. These photos aren’t the best as they were taken at 10pm last night when I diced with waking them by putting the light on when checking on them but I will treasure them forever and their beautiful sleepy faces. 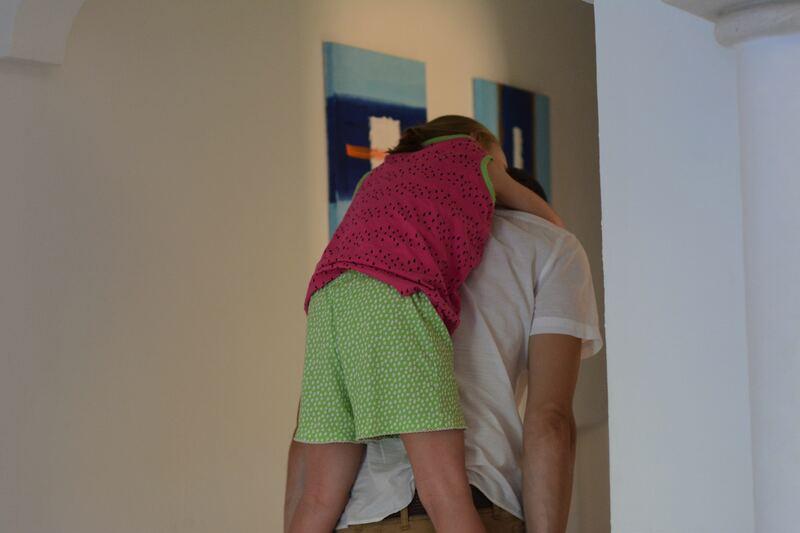 I love this photo below though, at home we tend to sit on our bed and read before taking the children to their rooms and for a long time Eddy has taken Eva like this, stood on his hands and arms wrapped around his neck like a monkey. She gives her little bum a wiggle to signal goodnight without having to use her hands that keep her firmly in place and I just love it, it’s a precious moment that again I am so happy to have captured and one that is solely shared between Eddy and her even on holiday. I hope you are having a lovely holiday. It’s the little routines, (like Eva’s carry to bed & wiggle) that are the ones I love to treasure. I love ordinary moments for the prompt to record them too. Mine don’t sleep well together either. James always wants to have a sleepover in his sister’s room, but in reality, about 20 mins later he always retreats back into his bed because he likes his space! I am glad my two aren’t the only ones to like their own space, to be honest I do too so maybe they get it from me! I could have written this! 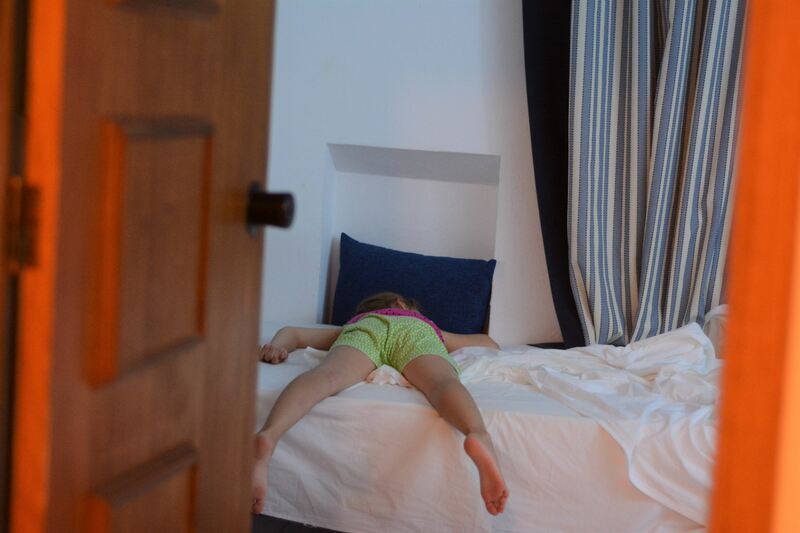 We stayed in a hotel two nights earlier in the week and the kids were sharing a double bed but it was a nightmare to get them to go to sleep as they were overtired and excited – not a good combination! I hope it’s not affecting everyones sleep for much longer now you’ve got a solution! Thank you it was a lovely holiday once we found that magic sleep solution!